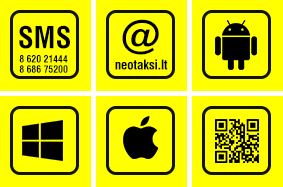 A private limited liability company “Šiauliai veža”, better known to the residents of Šiauliai city as NEO TAKSI, is one of the largest companies which provides taxi and shuttle services in Šiauliai city. We have accumulated more than 30 years of experience in the field of taxi business, therefore cars of our company are in good condition, convenient and comfortable. More than 150 vehicles are used for customer service. We have the opportunity to carry passengers by cars and high seating capacity cars. Upon request, we can drive you to any city in Lithuania. We invite you to become a taxi driver or a shuttle driver in our team with your own or company car. Your salary depends on the completed orders. You have an opportunity to work a flexible schedule. Carry your employees with NEOTAXI! Your employees will be served first. Payment according to mileage every month. You will be able to control easily the number of employees who use our services. Having signed a contract with our company, you will be able to transport the employees of your company to your company premises, pick up your guests from an airport or other locations under attractive conditions. To sign a long-term contract for carriage of employees, please write us now.